How to Wear Flannel. When we talk about casual and comfortable clothes that are also stylish the first thing that pops into the mind is a flannel outfit. Be it a guy or a girl, almost everybody has flannel apparel in his or her wardrobe. Since we have already discussed the flannel outfit ideas for men, let’s take a look at the ways women can don on this staple outfit. For all those looking for some pointers in this regard, you are at the right place. No matter how old-school this look is, when pulled off in the right manner it never fails to captivate. To sport this look, unbutton the shirt then put it around your waist and tie the sleeves together. Many people find leggings really modish. 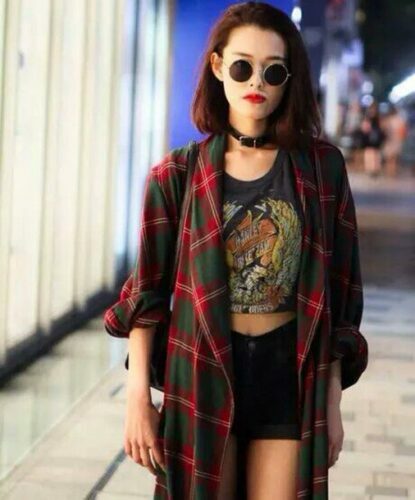 A flannel shirt with tights and long boots is the ultimate fashionista look that you should try at least once. You’ll notice how it always wins! If your flannel shirt is long you can wear it like a dress. That’s the trendy way to do it. With the flannel dress you can wear long boots to amplify the style. Here’s the classic look. Wear the flannel unbuttoned over the tee. If you think that’s too mainstream for you, wear it over a tight t-shirt, unbutton it and tie together the corners at your midsection. If you have a flat belly, you are bound to make a tough girl yet snazzy impression this way. In winters you should always wear a flannel that’s thick. Pair it with a hoodie and jeans. Or wear a coat over it. You can go for other options like jackets and bumper jackets as well. Red flannel shirts are more popular than any other color combos. Well obviously, because they look so fashionable. These either come with black or white combinations. The red comes in many shades from scarlet to maroon. Choose the tone that goes best with your complexion. Grey flannel shirts look super cool with black jeans. These look best with a white tee underneath. Oversized flannels can be worn as dresses. Or you can wear the flannel shirt that’s too big for you with skinny jeans to balance it out. A flannel shirt with buttons done is a formal way to carry it. It looks neat and fancy at the same time. To make the look a bit informal you can don on ripped jeans with it. There are several flannel outfits you can wear for parties. Flannels aren’t always plaid, they also come plain. They aren’t only worn as shirts and dresses but as suits as well. There are many flannel ideas you can take advantage of. Just choose the style that suits you best and be yourself. Whichever color you like the most would be the best for you. However, in the race of flannel, the color that outclasses all others is red. Red is the classiest, it looks bold yet serene.